Asian carp that have invaded and steadily taken over rivers in America will meet the wrath of U.S. Army Corps of Engineers if they try to enter the Great Lakes. 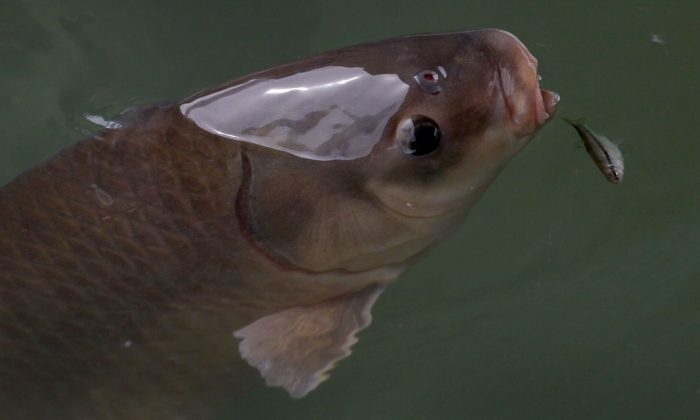 The carp have been pushing their way up the Mississippi River and into the Great Lakes’ Lake Michigan. The Fish and Wildlife Service found Asian carp DNA in the Chicago River, solidifying the fear that some are already present. The Corps has an extensive plan to secure the Great Lakes from the spread of Asian carp with high-tech engineering, Scientific American reported. The Army looked over 98 possible technological defenses. They settled on an electric barrier combined with noise generation. Low-current electrodes in the water will either stun or kill the carp as they approach the barrier. Water jets will then blow the fish backward and away from Lake Michigan. The noise generation is meant to confound the fish with sensory overload. Before the Corps can institute any of their measures, the face rounds of federal, local, non-profit, and for-profit organization approvals. Commercial fishing efforts will continue to pull out the nuisance fish for food. The fish is often sold to Asia, where it is heartily consumed. Efforts to fish out the species for consumption in the United States have not yet achieved enough success. People still consider the rapidly propagating fish to be a nuisance. Efforts like The Original Redneck Fishin Tournament every summer in the Illinois River have brought regular people together to help pull out the excessive carp. There have also been culinary events designed to introduce the taste of Asian carp to the American palate. Nothing so far has curbed the fear of how the Asian carp could wreck the high-profit fishing industry in the Great Lakes. Lake Michigan alone has a $7 billion fishing industry under threat. Asian carp could devastate the food sources native fish need to survive. Asian carp were brought over from China decades ago. They were introduced to deal with microscopic phytoplankton plants in aquaculture ponds and sewage treatment lagoons in Arkansas. Flooding caused them to escape and spread into the Mississippi River. Efficient feeding and breeding techniques allowed them to continue on their journey, creeping into the water systems that connect with the Mississippi River. The threat of their larger spread continues.